W Permadi, A Rachmawati, D Tjahyadi, H Syam, K Mantilidewi, R Farid, M Ritonga. A 3-Year Randomized Controlled Trial On The Safety Of Newly Produced Double Rod Levonorgestrel-Releasing Contraceptive Implants Duplant® With Double Rod Levonorgestrel-Releasing Contraceptive Implants Indoplant® Controls At Dr. Hasan Sadikin General Hospital Bandung Indonesia. The Internet Journal of Gynecology and Obstetrics. 2019 Volume 23 Number 1. Background: A newly produced double rod levonorgestrel-releasing contraceptive implants Duplant® has been developed. The safety of this formulation was assessed in the current study. Methods: The present study presented the results of clinical trials phase III from 2011 to 2014 at the Dr. Hasan Sadikin General Hospital Bandung Indonesia which compared the safety of the newly produced double rod levonorgestrel-releasing contraceptive implant Duplant® with randomized double rod levonorgestrel-releasing contraceptive implant Indoplant® as controls. Both implants contain 75 mg levonorgestrel, releasing 30 μg/day. Patient involvement: After patients were given adequate information about the study design and given a chance to retreat from the study at patient's will, they signed the inform consent and were included in the study. A total of 72 patients using Duplant® and 78 patients using Indoplant® were included. The safety end-points were blood pressure changes, weight gain, menstrual cycle changes, and pap smear result. Statistical analysis for parity, menstrual pattern, and pap smear analysis was performed by the Kolmogorov Smirnov test. Age, systolic as well as diastolic blood pressure, and body weight were analyzed using the Mann Whitney test. Data were statistically analyzed using SPSS version 20.0 for Windows. Result p<0.05 was considered significant. Results: The use of two rods implants Duplant® showed similar adverse events compared to the control Indoplant®. There was only a significant difference in the systolic blood pressure pressure changes (p<0.05) while no statistical difference in emerging side effects of diastolic blood pressure, weight gain, menstrual cycle changes and pap smear result were seen (p>0.05). Conclusion: Duplant® was relatively safe to use as a newly developed two rods type of implant. A newly produced double rod levonorgestrel-releasing contraceptive implant, Duplant®, has been developed in Indonesia. Our results showed that Duplant® was relatively safe to use as a newly developed two rods type of implant. Duplant® may be considered in the contraceptive method in the Indonesian national program. A progestin only implant-based contraceptive method is a highly effective implant yet can restore fertility quickly. Additionally, the implant has only few side effects. For over 35 years, this method has been approved in more than 60 countries and used by millions of women around the world1. Due to its high effectiveness and ease of use, the implant is indicated for women who need progestin-only contraceptive methods, for example teenagers with poor adherence to the use of contraception, and healthy adult women who intend for long-term contraception2-5. In most countries, there are two types of contraceptive implants: single-rod etonogestrel implants and double rod levonorgestrel. The pharmacological properties and the effects of both implants are similar. In the United States, only the etonogestrel implant is available, while in other countries double rod levonorgestrel (Jadelle®, Sinoplant®) and six capsules system (Norplant®) are available2-5. Until now, the types of implants available in Indonesia are still limited (recently known are Norplant®, Indoplant®, Sinoimplant® and Implanon®). A multi-center study of Indoplant® conducted for 3 years showed a moderate safety and efficacy in preventing pregnancy. The compliance is quite high, with 93 percent compliance in the third year. Side effects and complaints reported include bleeding, dizziness, and headache; however, these disappear in time6. Duplant®, a double rod levonorgestrel-releasing contraceptive implant is a new kind of implant and a copy of Sinoimplant® drugs. This implant is intended to be included as contraceptive method in the national program, thus it is necessary to conduct a clinical trial to study the safety of this newly produced Duplant® compared to Indoplant® as a standard drug. We have performed a clinical trial phase III at Contraception Outpatient Clinic of the Dr. Hasan Sadikin General Hospital Bandung in Indonesia form 2011 to 2014. Incomplete data of blood pressure, weight gain, and menstrual cycle regularities during the whole study. Patient involvement: Patients attending the Contraception Outpatient Clinic of Dr. Hasan Sadikin General Hospital Bandung Indonesia were included after they were given adequate information about the study design and given a chance to retreat from the study at patient's will. They had to sign the inform consent and were then included in the study. The patients were randomized to use Duplant® or Indoplant® both contain 75 mg levonorgestrel, releasing 30 μg/day. A total of 72 patients using Duplant® and 78 patients using Indoplant® were included. The patients were observed for side effects of increased blood pressure, weight gain, menstrual cycle irregularities and pap smear analysis. The patients were assessed eight times for changes in blood pressure and weight gain with the following schedule: first year: month 1, 3, 6, 12; second year: month 18, 24; third year: month 30, 36 after insertion. A menstrual cycle questionnaire was done at the third year after insertion, pap smear analysis was done at the initial and at the third year after insertion. Parity, menstrual pattern and pap smear analysis were performed by the Kolmogorov Smirnov test. Age, systolic, diastolic, and body weight were analyzed using the Mann Whitney test. Data were statistically analyzed using SPSS version 20.0 for Windows. A result p<0.05 was considered significant. Comparison of parity and age of users. Comparison of changes in systolic and diastolic blood pressure, body weight, and menstruation pattern between Duplant® and Indoplant®. Comparison of changes in pap smear result between Duplant® and Indoplant®. As seen in table 1, there was no significant difference in the proportion between parity and age of patients using Duplant® and Indoplant®. It can be concluded both groups have no differences in baseline characteristics indicating both groups were homogenous. The mean age of the subjects in our study was 31.65 ± 6.632 years old in the control Indoplant® group compared to 32.87 ± 7.022 years old in the Duplant® group. A multicenter randomized study reported 27.7 + 6.2 and 28.1 + 6.4 years as the mean age of the participants in the ENG-implant and LNG-implant group, respectively. In addition, there are several studies that reported the average age of subjects who used implant contraception that was similar with our study. The majority of our subjects were women ≤35 years old and parity 1-3. The reason of preference of contraceptive method in these subjects is maybe because the implant is an effective and reversible contraceptive method7-12. Data in table 2 indicated only changes in systolic blood pressure showed a significant difference. Changes in diastolic blood pressure, body weight, pattern of menstruation showed no significant difference between the Duplant® and the Indoplant® group. Table 3 implicated there was no difference in pap smear result at initial of insertion compared to that of the 3rd year pap smear result in both the Duplant® and the Indoplant® group, indicating that the Duplant® implant showed similar insignificant effect to the dysplastic changes of the cervix. The adverse events of increasing systolic blood pressure was found in our study, while diastolic blood pressure showed no significant difference compare to control. Increased systolic and diastolic blood pressures were not mentioned in previous studies. One study reported only two of their subjects’ blood pressure reached a slight increase in blood pressure during the study, but after discontinuation of the implant contraception, the hypertension subsided10,12. In the present trial, there was no significant increase body weight with Duplant® use. It was in accordance with the results of another study which stated that the use of Indoplant® and Marplant® implant contraceptives only resulted in a slight body weight gain as well as the body mass index (BMI) in their patients. On the other hand, a different trial showed a frequent increase in body weight in the subjects that used an implant during the study, yet the increase was not substantial10,12. Many studies showed as the reason for discontinuation of the implant use was mostly due to bleeding disturbances which included amenorrhea and oligomenorrhea. A study showed adverse event of menstrual disturbances due to Indoplant® use was experienced by more than 60% of the subjects and the percentage kept increasing with extended conceptive use. This was consistent with the results in our study which reported more than 80% of the subjects experienced amenorrhea or oligomenorrhea. However, there were still some reports that showed heavy menstrual bleeding as an adverse event8,10,12. 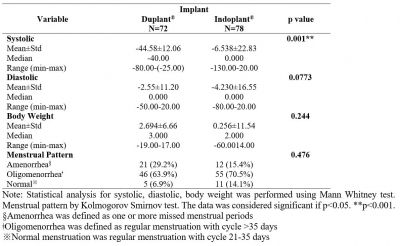 We realized our study present limitations such as length of the study was limited to three years, while implant effect such as regain fertility, or return of normal menstrual regularity, and normal blood pressure after removal were not assessed. Another suggestion for future research is to look at adverse effects in patients with prolong implant use. These will present thorough information on the safety of Duplant® as newly developed double rod levonorgestrel-releasing contraceptive implant. Based on the analysis above, it can be concluded that the use of the two rod implant Duplant® showed similar adverse events compared to the control Indoplant®. There was only a significant difference in the systolic blood pressure changes while no statistical difference in emerging side effects of diastolic blood pressure, weight gain, menstrual cycle irregularities, and pap smear result was seen. Thus, Duplant® was relatively safe to use as a newly two rod type of implant contraception. Authors would like to acknowledge assistance of staffs at Contraception Outpatient Clinic of Dr. Hasan Sadikin General Hospital Bandung in Indonesia. This study protocol was approved by the by Ethical Committee of the National Board of Family Planning and Civil Services Number 227/I/PD-101/G/2010. 1. Meirik O, Fraser IS, d'Arcangues C. Implantable contraceptives for women. Hum Reprod Update 2003;9(1):49-59. 2. Bongaarts J, Johansson E. Future trends in contraceptive prevalence and method mix in the developing world. Stud Fam Plann 2002;33(1):24-36. 3. Wellings K, Jones KG, Mercer CH, et al. The prevalence of unplanned pregnancy and associated factors in Britain : finding from the third National Survey of Sexual Attitudes and Lifestyles (Natsal-3). Lancet 2013;382(9907):1807-16. 4. National Collaborating Centre for Women's and Children's Health. Long-acting reversible contraception: the effective and appropriate use of long-acting reversible contraception. 2005 [Accessed 1 Mei 2016]; Available from: http://publications.nice.org.uk/long-acting-reversible-contraception-cg30. 5. Filner LB, Jerman J, Kavanaugh ML. Changes in use of long-acting contraceptive methods in the United States, 2007-2009. Fertil Steril 2012;98(4):893-7. 6. Affandi, B. Studi multi senter perbandingan Indoplant dan Norplant® di Indonesia, Puslitbang KB dan KR, BKKBN Jakarta, 2005. 7. Bahamondes L, Brache V, Meirik O, et al. A 3-year multicentre randomized controlled trial of etonogestrel-and levonorgestrel-releasing contraceptive implants, with non-randomized matched copper-intrauterine device controls. Hum Reprod 2015;30(11):2527-38. 8. Gunardi ER, Affandi B. Serum levonorgestrel concentration and cervical mucus viscosity after six months of monoplant® implantation. Medical Journal of Indonesia 2014;23(1):25. 9. Ali M, Akin A, Bahamondes L, et al. Extended use up to 5 years of the etonogestrel-releasing subdermal contraceptive implant: comparison to levonorgestrel-releasing subdermal implant. Hum Reprod 2016;31(11):2491-98. 10. Manan H, Asih L, Anggraeni M. Perbandingan kontrasepsi implan dua batang “Marplant dan Indoplant”. Jurnal Kependudukan dan Keluarga Berencana 2014;1(1):9-16. 11. O’Neill E, Tang J, Garrett J, et al. Characteristics of Kenyan women in a prospective cohort study who continue using subdermal contraceptive implants at 12 months. Contraception 2014;89:204–208. 12. Zheng SR, Zheng HM, Qian SZ, Sang GW, Kaper RF. A randomized multicenter study comparing the efficacy and bleeding pattern of a single-rod (implanont) and a six-capsule (norplantt) hormonal contraceptive implant. Contraception 1999;60:1–8.